Following the releases of December 2018 security patch for the Moto G5S and the Moto G5S Plus, more Motorola phones are receiving the latest Android security updates. The Moto G5 and G5 Plus are the latest devices to receive the December 2018 security patch level. The OTA is rolling out across the globe in phases. It is based on stable Android 8.1 Oreo that we received a couple of months ago. We already know the Moto G5 and Moto G5 Plus have already received the official stable Android Oreo update. Here is the latest security patch for the two phones with build number OPSS28.85-13-5. This is the second security patch update after October and the first August 2018 that featured 8.1 Oreo. Most of the Motorola devices are being updated to Android Oreo OTA update now. So go to settings > system updates > and check for OTA updates. If available, download and install manually. 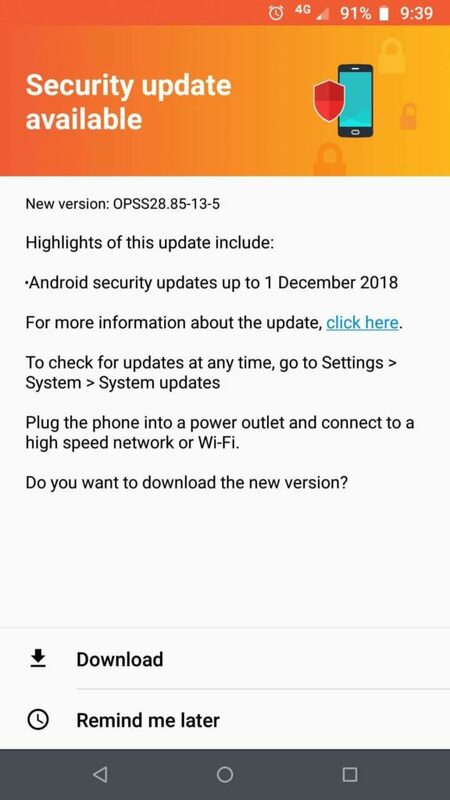 Not much is known about the update, except it features latest December 2018 security patch and a new build number OPSS28.85-13-5. For what we know, it comes after a long time and you should update immediately. You may expect changes like battery optimization, improved RAM management, more third-party app compatibility, and general bug fixes. The OTA is currently live in Asi; more specifically India for retin, in United States retus, in Europe; more specifically in Germany, retla, and more. Other countries will soon start receiving the same. How to download Moto G5 and G5 Plus December 2018 OTA update? As a users you can capture OTA update yourself. Once the OTA update is live for Moto G5 Plus phones you can go through the following steps to capture the latest OTA update from different regions and share the download links. Make sure your Moto G5 (Plus) runs Android 8.1 Oreo (August Patch). Go to Settings app in the apps drawer. If the October update is live in your region, you will see a “download” option. After the software is downloaded, select “Install”. Currently, Motorola is working on Android 9.0 Pie for some of its latest devices via soak test. So in order to participate, and update your Moto G to Android 9.0 Pie Beta you will need to sign up for Motorola Feedback Network (Soak Test).